Quentin Tarantino and Leonardo DiCaprio. 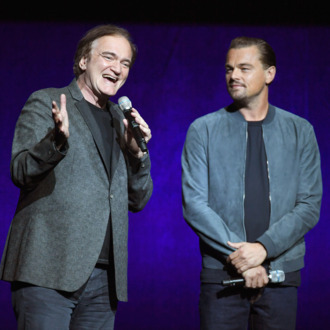 Not one single frame of Quentin Tarantino’s Manson-murders-era period piece has been filmed, but the director and his star Leonardo DiCaprio showed up at CinemaCon to promote the movie on Monday. Tarantino showed up to give details about the movie, which follows an actor and his stunt double, and will star DiCaprio and Brad Pitt. “It takes place at the time of the hippie revolution and it takes place at the height of the new Hollywood,” Tarantino said. “During this summer, we will little by little, street by street and block by block, be transforming Los Angeles into the psychedelic era in 1969.” Tarantino compared the movie’s star power to another classic cinema pairing: “the most exciting, dynamic star duo since Paul Newman and Robert Redford.” Leo admitted that it’s “hard to talk about a movie you haven’t made yet,” but that he was excited to work with Tarantino again after Django Unchained. Sony, which won the bidding war for Tarantino’s newest movie, was the first studio to present its slate at the conference. The studio’s show of confidence in Tarantino — both DiCaprio and Sony chair Tom Rothman called Once Upon a Time in Hollywood the best script they’ve read in years — comes after the director weathered criticism following accusations that the director sexually harassed Rose McGowan and choked and spat on Uma Thurman during the filming of Kill Bill.